Orthodontics has evolved to such an extent that today there is an excellent scope of getting your teeth straight without disfiguring your smile during the treatment. 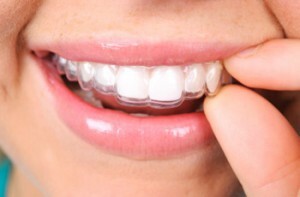 Invisalign was coined by combining two words-‘invisible’ and ‘aligners’. Invisalign are clear aligners that can straighten teeth in a virtually invisible manner. Invisalign works on a very straightforward concept. The patient is supposed to wear these clear aligners for a period of two or four weeks after which he is supposed to discard them and shift to a new pair of aligners. For the complete treatment at least 20 to 30 sets of aligners are required which are changed in every two or four weeks. The aim of the treatment is to achieve a minimum of 0.25mm of tooth movement in a period of a month. It is suggested that a person should wear the braces for a minimum of 20 hours daily. The most important advantage of Invisalign is the aesthetic enhancement it delivers during the treatment and after the treatment. When compared to the metallic smile of traditional braces, Invisalign delivers a clear and natural smile. These clear aligners can be easily removed when you are about to have something to eat. Traditional braces can be removed only by a dentist or an orthodontist. When it comes to the traditional braces, maintenance of hygiene is a difficult affair. Food particles stuck in between the wire components are tough to be removed. With Invisalign, all such problems can be kept aside as the aligners can be cleaned normally. Owing to the smooth surface of Invisalign, there are absolutely no or minimal chances of bruises. This is an advantage when compared to the traditional braces wherein the wearers normally tend to hurt themselves due to the metallic components. These aligners cover only the tooth surfaces. Hence, there is no soft tissue impingement. This is one of the reasons why these aligners are extremely comfortable.At Dental Care of Bryans Road, Dr Akash Agarwal and his expert team will help you out with any queries regarding Invisalign.